"Why are some traders so incredibly successful, regardless of the ups and downs of the market? What's their secret?" There is no secret. These super confident, top-earning traders have simply made "successful trading" a habit. And you can, too… if you invest just 14 minutes of your time each day for the next 30 days. Yet the NBA superstar had to make 15 attempts before he succeeded… in failing! One shot after the other went into the hoop, much to the annoyance of the director. Michael tried to miss. He really did. But he had made "successful shooting" such an ingrained habit that it was a difficult one for him to break, even when he wanted to. Now, imagine if "successful trading" was YOUR habit! Something that came easily and automatically to you day after day, week after week. What would be the impact on your income? Your confidence? Your lifestyle? In fact, that's the difference between traders who make a lot of money - and really enjoy their lives, and those who struggle to make a profit - and are unsatisfied. Everyone has access to the same news, the same numbers, the same strategies. But it's those traders who have trained their mind for success that consistently do well… and, indeed, become traders that others in the industry want to emulate. How do you make "successful trading" a habit that comes easily and automatically to YOU? It's simpler than you may think. In fact, you can be well on your way to becoming the confident, top-earning trader you always wanted to be - in just 30 days! - if you follow the right plan. Did you know that even a minor mental barrier to successful trading can have a huge impact on your business? Take, for example, the trader who bangs his hand on the desk every time a trade goes south. Chances are, he doesn't realize that seemingly innocuous behavior is reinforcing anger and frustration, powerful emotions that can increasingly make him reluctant to pull the trigger - even under winning conditions! Managing his Emotional Risks, would not only make his day more enjoyable, but also increase his win record and income. And that's just one behavioral tweak. Imagine if he made 30 such improvements over the course of a month. Better habits equal less stress and MORE profits. It's the indisputable equation of trading success. Notice the challenges each day. Detect the strategic and emotional patterns that are getting you the wins, and contributing to your losses. Uncover the underlying reasons why you are not fulfilling your own expectations. Overcome the mental barriers that are costing you lots of money. Recalibrate your skills and strategies, and join the ranks of super traders. Develop a “Mental Edge” to win the game of trading. Gain advice and encouragement from an expert as you go through the process. 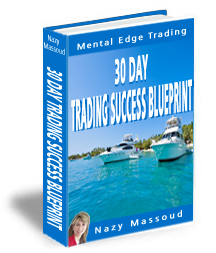 The 30-Day Trading Success Blueprint is designed specifically to help you do just that. Just a few lines to thank you for everything you have done for my trading. I can't tell you enough that if it wasn't for you, I would not be trading at all at this time. Your sound, disciplined approach keeps me most of the time on the right side of the market. This has caused a huge boost to my confidence and to my consistency in generating profits. Nazy has an uncanny ability to pick apart the weak areas of your personal state, identify them for you and then provide simple yet powerful exercises in which to correct those negative areas and turn them around to positive building blocks for a successful life. The 30-Day Trading Success Blueprint is very easy to follow. But don't be fooled by its apparent simplicity. The program is based on breakthrough psychological and performance principles that will create the "successful trading" habit for you in just 30 days. As you work through the program, you'll be learning how to manage your Emotional Risk and clearing away those bad habits that are holding you back from the success you deserve. You'll also be reinforcing the strategic decisions, behaviors, thoughts and feelings that consistently lead to winning trades. Gradually, all the factors that contribute to "successful trading" will become more and more of an ingrained habit. You'll find opportunities faster, win more often, dramatically increase your income and, perhaps more importantly, truly enjoy the rewards of your business. Like Michael Jordon, it will become easier for you to win, and harder for you to lose. Thanks to your insights I have been able to turn a losing futures account into my most valuable asset and most powerful income generator. More importantly, you have given me hope for the future I want and can actually now achieve. I wake up every trading day exited and ready to go. I ask myself, “I wonder how much money I am going to make today?” Before I discovered you, I would ask myself, “how am I going to make up for the losses I will undoubtedly suffer today?” Often, I think of how lucky I am to have discovered you. My only regret is not having found you years ago – that would have spared me much grief and suffering – and money!!! Keep up the fantastic work and I look forward to working with you for years to come. Identify the strategic decisions and “Mental Edge” that got you the wins so you can duplicate those successes – easily - again and again and again. The 30-Day Trading Success Blueprint is the only program of its kind that will accomplish both these objectives for you. Go home with a smile on your face more often. These may seem like lofty outcomes, perhaps too good to be true. But these are exactly the kind of results participants achieve while working through this 30-day blueprint. After 15+ years of working on Wall Street and being in the heart of action on the trading floor, and supporting such financial giants as Morgan Stanley, Bankers Trust, UBS, Chase Manhattan Bank and JP Morgan, I’m now putting my experience to use by training traders from all walks of life on little-known insider secrets about the “psychological triggers behind the BIG money”! Using my hands-on experience as a Business Analyst, Strategist, Project and Risk Manager for some of the biggest clients and portfolios in the world, I can help you develop the mental edge necessary to winning in the game of trading. Combining my quantitative skills working the risk management side with my qualitative skills as a trading advisor, I help you tackle the Emotional Risks of the market that are costing you money. This enables you to develop the confidence, discipline and mental edge required to master the market and become financially free! This program is specifically designed to be easy-to-follow. You'll have no trouble working through it on your own. However, when you have questions, need coaching on a particular issue, or just support and encouragement, I'm here to help. The 30-Day Trading Success Blueprint includes a 30-Minute Coaching Session with me personally. You may schedule that coaching session anytime during the next six months. Use it during the 30-day Trading Success Blueprint period, or as a follow-up to tweak and improve your "mental edge" later on. Bring me your toughest issue or challenge. In just 30 minutes, I promise to provide you with customized insights and strategies that will have a dramatic impact on your business, income and life! I encourage you to get started with the 30-Day Trading Success Blueprint today. The sooner you do, the sooner "successful trading" will become a habit for you. To give you a gentle nudge - Hey, I am a coach! 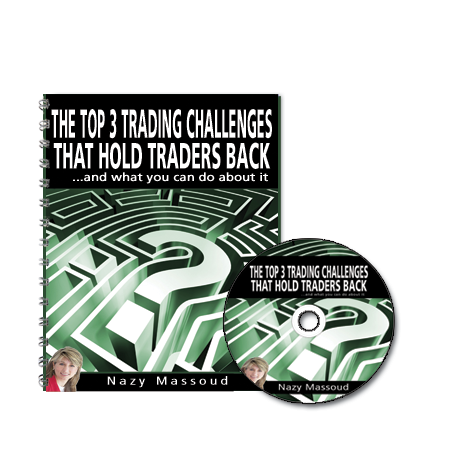 - I'm also including a FREE copy of my popular audio program and professional development manual: "The Top 3 Challenges That Hold Traders Back… And What You Can Do About It". The regular price is $97. But I'll send it to you at no cost… with my compliments. A 9-step process for ending the First challenge once and for all. An 8-step process for developing the skill of the second challenge. The secret to how to develop your Mental Edge so you can make more money consistently. These are the same strategies my coaching clients use to significantly increase their incomes. Both the audio program AND professional development manual are yours FREE when you download the 30-Day Trading Success Blueprint today. I asked Nazy for "help" – what she gave me was over 1000%: holding my hand resulted in my gaining millions of dollars. She's unbelievable! She has the uncanny ability to hear what you really need as opposed to merely responding to what you ask for. You have to try it for yourself to know what I'm talking about. Simply put—Insightful, inspiring, intelligent but most of all intuitive. Nazy read me like a book. She doesn't finish with a talk but a firm course of action. Money well worth spending!!! Complete instructions for completing the program. 25 daily and 5 weekly questionnaires'. It is like having your personal coach with you to help direct your focus and get the best results in the shortest time. Return on investment? That's a no-brainer! Just one successful trade can recover the cost of the program 10 times over! Ready to Have Your Best Month Ever? Let's face it. Some people have a good handle on their Emotional Risk that leads naturally to success. The good news is, in just 30 days, you too can have a good handle on your Emotional Risk, and enjoy all the perks - the income, the satisfaction, the confidence - that comes with having that mental edge. Why not make today "Day One" and get started right now? Try the 30-Day Trading Success Blueprint for one month. Complete the entire program! If you feel it hasn't helped you to make better trades, feel more confident, and enjoy your business more, then just send me an email and I'll refund your money. No questions asked.